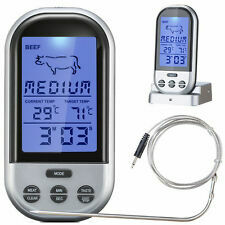 MEATER+ Smart Meat Thermometer - 165 Ft Range! Get Wireless Alerts when ready! Get wireless Alerts when Meats are ready! 165 FT range! Indicates optimum steamed milk temperature for espresso drinks. Designed for food safety and savory, tasty results when roasting meat or poultry, the new CDN Procreate Meat/Poultry Ovenproof Thermometer (IRM200-GLOW) features a glow-in-the-dark dial that makes it easy to see in the oven. This new model is extremely easy to use, with an extra large 2-inch (5.1 cm) dial with a durable laboratory glass lens and a 5-inch (12.7 cm) stainless steel stem. It is waterproof and features a handy temperature guide and target range indication to take the guesswork out of roasting. 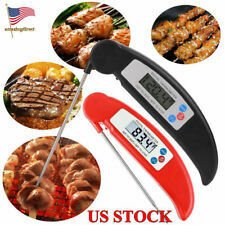 The CDN Procreate Meat/Poultry Ovenproof Thermometer stands out as a value over time, because it can easily be recalibrated with a simple boil test. This means that you can count on accurate temperature readings year after year. Ending Soon. Handle: Our case features a very comfortable rubberized handle that allows for easy and convenient portability on the go. New Arrivals. Why Choose Us! 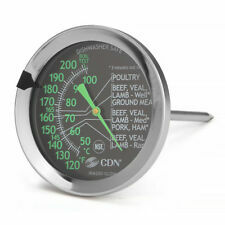 Take the guesswork out of cooking times with this InstaRead thermometer by CDN. Made of premium grade stainless steel, the slender probe inserts easily into roasting meat and gives a fast temperature read out. Accurate to within 2 degrees, the thermometer registers a longer range than most, from 0 to 220 degrees Fahrenheit, and can even be recalibrated for continued accuracy. Therefore, the finely calibrated thermometer is perfect for testing the temperatures of everything from chilled drinks to yeasts, dough, and tempered chocolate. While not oven proof, the polycarbonate lens creates a tight seal and also magnifies the numbers for easy reading. The thermometer may be used on meats cooked in a conventional oven, microwave, grill, rotisserie, and smoker, but should be removed from the meat as soon as the temperature is registered. CDN Replacement Probe for DTP482 probe thermometers. The high heat sensor cable can withstand temperatures up to 500℉ (260℃) and measures approximately 3 feet (91.4 centimeters). The probe measures approximately 5 ½ inches (14 centimeters). Recommended: Clean the thermometer stem before each use. Important: Do Not use probe in the microwave, only the probe can be submerged in liquid. The cable/probe connection is not waterproof. Model: AD-DTP482. The ThermoPro TP03A is an effective solution to achieve the most accurate temperature in a matter of seconds. Probe Length: 3.9" food grade stainless steel probe. Fast and accurate temperature reading within 4 - 7 seconds. By: Corona. Stainless steel. Safe for use on grill, oven or stove. Instant Read: Yes. Minimum Temperature: 100 deg. Probe Length: 6 in. Probe Length: 3.9" food grade stainless steel probe. We're more than happy to assist you. Battery: 1 x AAA battery(included). 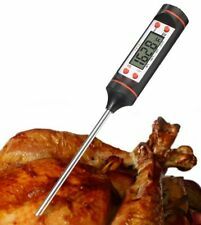 IRM190 CDN Ovenproof, Rotisserie, Roasting, Grilling Meat Pocket Thermometer! IRM190 ,by CDN®. NSF® Approved = Safe for food! Insta-Read Tip® = Quick Response! ProAccurate® = 2° Accuracy! Oven Proof Laboratory Glass Lens = Leave-In-Oven! NO Battery Required! • 5 Year Limited Warranty, backed by CDN®. Probe Length: 3.8" food grade stainless steel probe. - Unique Fast Reading system achieves an accurate temperature reading within 4 - 7 seconds. - Foldaway probe is designed for safety and cleanliness. ► 165ft Long Range Model: 100% WIRE-FREE that's perfect for outdoor cooking. Monitor your cook using the FREE app available for iOS / Android smart phones and tablets. Bluetooth 4.0 wireless connection up to 165 ft. Stainless Steel Instant Read 1" Dial Thermometer 0 Degree To 220 Degree F Shatter-Proof Plastic Lens Durable Stainless Steel Plastic Case/ Calibrating Tool.Stainless steel instant read 1" dial thermometer 0 degree to 220 degree f shatter-proof plastic lens durable stainless steel plastic case/ calibrating tool. ---Accurate- Our meat thermometer is oven safe and comes with an active sensor probe that reads and monitors to ensure that your food is always at a safe and proper temperature to avoid under or overcooked food. --- easy - Oven roasting thermometer is super easy to setup even for the first-time users. The sensitive stainless probe is heat resistant, and all the buttons are self-explanatory to get food temperature fast and accurately. ---Reliable screen - This meat thermometer in oven use, have backlight functionality for clear viewing in low light conditions with the extra-large and energy-efficient digital display for easy readability. Very versatile with different options for a delightful cooking experience. --- long distance - With its sensitive sensor probe, you will enjoy accurate temperature measurement across a wide range. Best for use when grilling on your gas barbecue or turkey fryer, using hot oil to deep fry, brewing beer and wine. When fall from the grill. You will get accurate reading with Auto Shut-off and HOLD feature & large LCD display. (4) NSF APPROVED. (1) STAINLESS STEEL CASING AND STEM. Durable stainless steel stem with display protected by a rugged polycarbonate crystal lens. Pocket case included. (Two batteries are included.). TAYLOR PRECISION PRODUCTS. These types of problems need to be presented to the manufacturers /suppliers / distributors. Soft Grip Handle. Large easy-to-read digital display. 130 to 190°F. Tundra was started in Boulder, Colorado in 1993 – over 20 years ago. A liftgate will lower the product to the ground for you. Kitchen Supplies. ProAccurate®. It's very important to us that you are happy with your order. Under no circumstances can we take back an item that has been used. A liftgate will lower the product to the ground for you. Tundra was started in Boulder, Colorado in 1993 – over 20 years ago. These color coded mini steak thermometers are great for easily specifying whose steak belongs to who, while ensuring that it is cooked to their liking! The two inch stainless steel probe is grill, oven, and pan safe and registers temperatures between 32℉ and 572℉. The Insta-Read® Large Dial Cooking Thermometer is perfect for professional results with meats, poultry, yeast, dough, and chocolate tempering. Use this thermometer for foods cooked in conventional or microwave ovens, smoke ovens, rotisserie, or on the grill - only after they have been removed. Made with a shatterproof and waterproof polycarbonate lens and stainless-steel housing - making it easy to pierce through meats. The thermometer has a temperature range from 60℉ to 220℉ and features a 1 ¾ inch red dial, making it easy to read exact temperatures. The plastic sheath includes a temperature guide and a pocket clip, it can even be used as a handle extension. Model: IRL220. Connectivity Suite: Monitor your cook from a phone or tablet over Bluetooth. 165ft Long Range Model: 100% WIRE-FREE that's perfect for outdoor cooking. Monitor your cook using the FREE app available for iOS (10.3 and later) / Android (5.0 and later) smart phones and tablets. Easy to use. A MUST HAVE item for cooking and BBQ enthusiasts. Temp range from -58 to 572 degree F (-50 to 300 C). Hand free and Auto shutdown in 45 minutes. Easy to use, maintain and light to carry. High accuracy.Can be used for kitchen cooking(steak, beef, pork, lamb, poultry, chicken, kebabs, hamburgers, skewers or vegetables),baking ,milk or bathwater. Foldable probe is made of stainless steel with anti-microbial coating which can prevent bacterial growth, more safety to use. Wide test range from -4°F to 482°F (-20°C to 250°C) with high accuracy ±1°F/0.5°C. The temperature is read and displayed on the LCD screen. It is not waterproof. - Probe Length: 4.7" food grade stainless steel probe. - Foldable design. - Include 1 x AAA battery. - °F/°C Switchable. Perfect for indoor/outdoor cooking, grilling, barbequing. It makes cooking and grilling easy. It can also be used to check the temp of water or milk. [COOK LIKE A PRO] Perfect for indoor/outdoor cooking, grilling, barbequing. It has good heat resistance (withstand up to 482°F/250℃), which can be used when grilling, baking, roasting, frying, smoking, and BBQ, etc. Display Type: LCD. RF Transmission Range: 65.62ft-98.43ft /20m-30m. Certified for accurach Reads temperatures up to 400 degrees Adjustable Pot Clip. Fast preset temperatures setting: Chicken,Turkey,Pork,Beef,Lamb,Ham,Veal,Fish. It Just Arrived-The Kitchen Tool That Will Put The Cooking Process In Auto Pilot! Modify Preset temperature: Option to modify the default temperature setting while cooking. Small enough to fit inside a pocket, it features a 304 stainless steel stem and ABS plastic handle and sheath for the ultimate in durability and performance. Stainless steel stem with 1.5 mm reduced tip. LONG FOLDING PROBE - Get the internal temperature of any cooked food quickly and safely. beef, chicken, pork, fish, lamb, or turkey. EASY TO USE 1st Open the stainless floding probe; 2nd. Belwares Wireless BBQ Meat Thermometer meets the critical needs for cooking, grilling and baking any meal you’re prepping for your special guests. KitchenAid Wireless Remote Timer and Thermometer - KN128BXOBA - BRAND NEW!